Qatar Airways is preparing a strong presence at the 2014 Farnborough Air Show, which opens today. Taking place in southern England, the show will see Qatar Airways fly the A350 aircraft for the first time at a flying display at a European air show. The A350, for which Qatar Airways is the global launch customer, will make its debut alongside two other major aircraft in the fleet. It is scheduled to join the airline’s fleet at the end of this year. Overall, Qatar Airways will have on display at Farnborough an Airbus A350, A320 and a Boeing 787 Dreamliner. The A350 will feature in the flying display, while the latter two will be on static display. 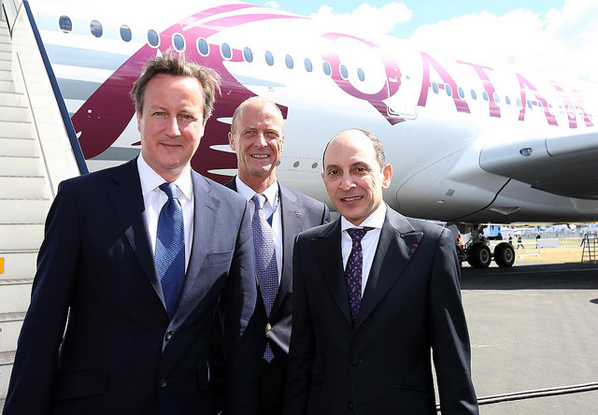 Commenting on the three aircraft on display at Farnborough, Qatar Airways chief executive Akbar Al Baker said: “Qatar Airways is determined to bring the best quality flying experience to its passengers and those at the 2014 Farnborough Air Show will get a flavour of what is to come. “These aircraft symbolise our dynamic growth and our constant focus on world-class quality. Static displays of military and civilian aircraft will be a key feature of the show as well as the hallmark afternoon flying programme in which the A350 is scheduled to participate. Now in its advanced flight test programme phase, the efficient A350 XWB airliners are scheduled to enter into commercial service in the fourth quarter of 2014. Qatar Airways has ordered 80 aircraft to date, leaning towards the larger A350-900 and A350-1000 models, which better suit its business model and passenger requirements. The A350 XWB is a family of mid-sized wide-body airliners designed to enhance fuel, operating costs and environmental efficiencies during medium-to-long haul airline operations. Featuring the very latest in aerodynamics, design and advanced technologies, these highly efficient aircraft provide better fuel efficiency of up to 25 per cent. Over 70 percent of the A350 XWB’s weight-efficient airframe is made from advanced materials combining composites, titanium and advanced aluminium alloys. The aircraft’s innovative all-new Carbon Fibre Reinforced Plastic fuselage results in lower fuel burn as well as easier maintenance.